For such a small compact unit, it’s no wonder this system is now the most popular solution amongst boat owners. The amazing simplicity of this sturdy unit means you’ll never be caught out on the water again! The Sani-Loo® system comes with complete installation instructions so you can install it yourself or by an approved installer. 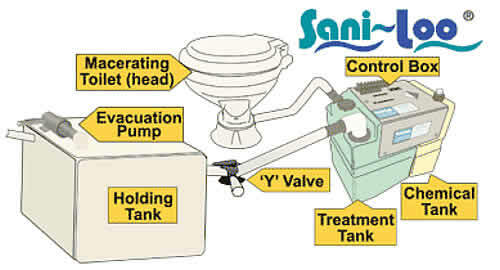 The Sani-Loo® Onboard Sewage Treatment System treats the macerated sewage as it enters the treatment tank. A simple control box introduces a chemical solution that sanitizes the raw sewage killing the bacteria and rendering the waste 99% clear of harmful bacteria. The treated waste can be pumped directly overboard in most areas unless you are in a nil discharge area. (In this case, it remains in the holding tank until the vessel is in an area where treated sewage can be discharged overboard.) Alternatively, the waste can be discharged at a shore-based pump-out station. The control box is designed for the marine environment and operates on 12V DC drawing less than 200milliamps. The main unit is a self-contained system with just one inlet and one outlet. The only other connection required is the connecting of the colour-coded wires from the junction box. Australia - Grade 'C' USA - Type '1' Marpol - Macerated and Disinfectant System. TFH Models can be configured to pump out holding tanks which contain macerated sewage. AQT Models can be fitted to most toilets that have a seperate water pump or solenoid to supply water. XP Models have a flush mounted touch pad and has an automatic Fill-Flush-Fill cycle. These models are totally programmable from the touch pad. When the AUTO button is pushed the XP model will put water into the bowl (to soak up toilet paper), pause for two seconds, then empty the bowl, pause for another two seconds, then put water back into the bowl to make a water seal. The XP models 3 stages can all be programmed to run from one second to twenty seconds. The chemical dosing pump can also be controlled so every brand of toilet, whether it is below the water line or on the bridge or deck, ensures the correct amount of chemical is injected on each flush cycle. The Sani-Loo A1 Model is to be launched June 2010.